We see it in the news every day. Politics can be cutthroat. Even in the well-known, most organized, and equitable law firms politics can rear its ugly head. New associates and recent lateral hires have to adapt to a new culture, learn the ropes and relearn how to survive when they’re inevitably thrown into the office politics ring. This is our take on surviving office politics. Focus. Don’t be the person who gets caught up in the middle of office politics. People who get drawn deep into office politics are not working on important things, or they are not focusing on tasks and projects they need to be focusing on. Continuously work on something that can advance your career goals, especially the goals aligned with those of the law firm. Keep track of your work it is evidence that you’re providing true value to the bottom line. Do not get too comfortable. While it’s important to make allies at work, it is also important to remember that work is not an informal gathering. Stay in your lane. Don’t share sensitive information about your personal life with colleagues. If you do, you may find that your personal business soon becomes part of the office gossip mill. Do not gossip. 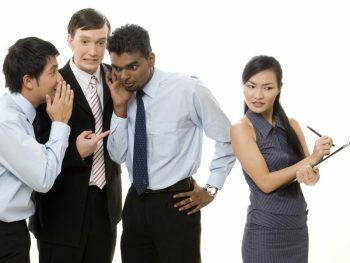 While it’s inevitable that someone will bend your ear with gossip, it’s important that you never share what you hear. Remain impartial and try to avoid participating in gossip whenever possible. Tip #1 (focus) helps here – you will be too busy focusing on your purpose and goals to get caught in the middle of office shenanigans. Nurture valuable relationships. It is critical to your survival and to your long-term success to nurture relationships with the people who offer real value to your life. These valuable people are the ones that always willing to give you critical feedback, mentoring, valuable advice, and important information. They are hard to come by, but once you identify those people, connect and stay connected. There are many ways not to get caught up in workplace shenanigans. Honestly, the best antidote to toxic office politics is creating tangible results for yourself and your employer. While you stay in your lane, think about that. Subscribe to the Leopard Blog for discussions about diversity, law firm insights, and other relevant topics.